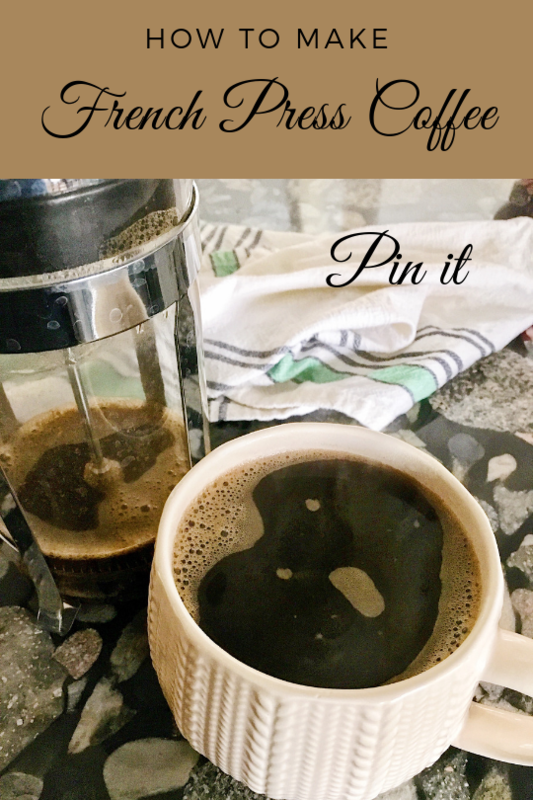 I’d like to share how to make french press coffee with you. 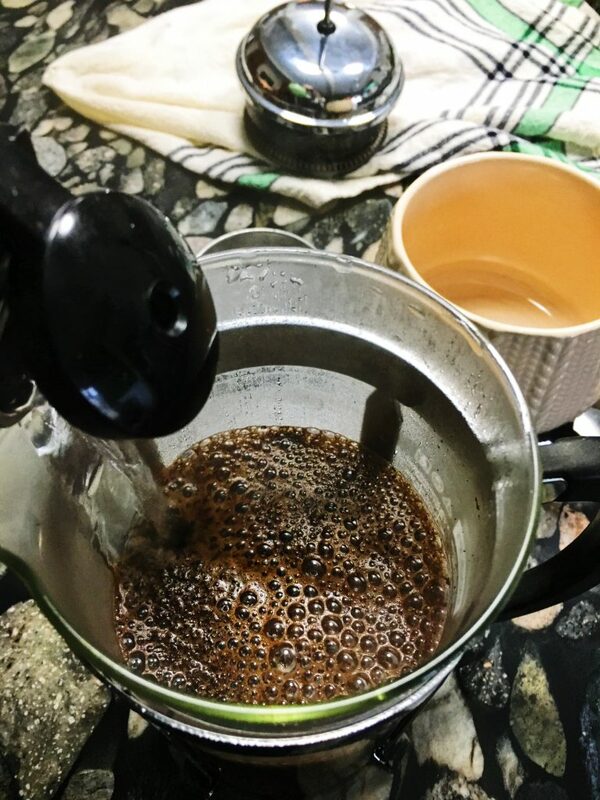 Making French press coffee is easy and inexpensive. It’s also delicious! This post contains affiliate links. If you click on my link to make a purchase there will be no additional charge to you. I make a small commission from your purchase that helps keep my blog going. Heat the water to boiling, then cool for 1 minute. Heat the water in a tea kettle to boiling, then take off the heat for about 1 full minute before making the coffee. Water for French press coffee should be heated to 195°F. If you want to ensure it’s the right temperature, use a thermometer to check. Grind coffee beans on the coarsest setting available. I find a burr grinder gives the most consistent grind. 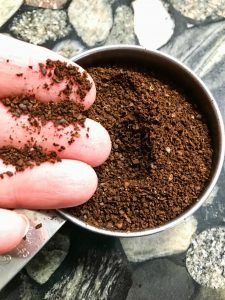 Add ground coffee to French Press. Pour the water into the French Press. Put on the lid. keep the plunger fully extended. Stir the water and coffee vigorously. Slowly depress the plunger into the coffee. by going slowly you are less likely to force the coffee grounds to pass above the screen strainer. 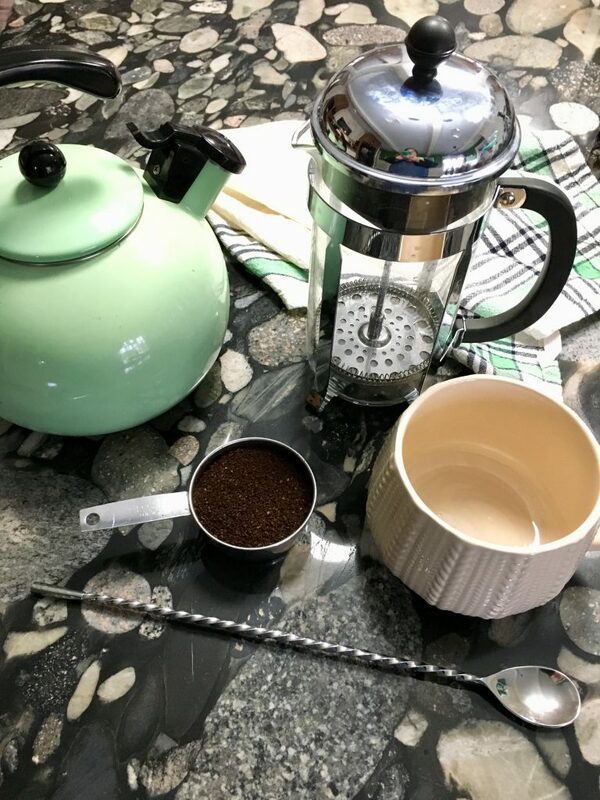 French Press Coffee is easy and delicious. You will need a French press carafe, filtered water, ground coffee and long spoon for stirring. I use a stove top tea kettle to heat the water but you can use your preferred method. Grind coffee so that it is coarse, about the consistency of kosher salt. Place ground coffee into French Press carafe. Heat water to boiling and allow to sit for 1 minute. this is a good time to grind your grab your favorite mug. You want your water to 195º use a thermometer if you prefer. 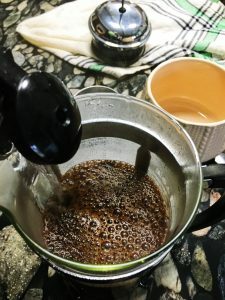 Pour water into the carafe and over coffee beans. Stir vigorously for about 30 seconds. Place carafe lid on with the plunger fully extended. Allow steeping for 4 minutes. Slowly depress the plunger. Pour coffee into your favorite mug and add cream and sugar to taste. 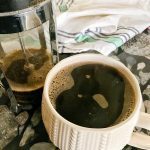 If you would like to see my Instagram Highlights demonstrating exactly how to make french press coffee click here. I like to wrap a towel around my French Press to help hold in the warmth. It’s easiest if you do this while the carafe is empty. To wrap the carafe I chose a thin kitchen towel and fold in half lengthwise. I can usually wrap this around twice. I simply tuck when corner under the wrapped towel. You can choose to transfer the coffee to a carafe to keep warm. But honestly, I find with the 32 oz carafe I drink it too fast to warrant that. Let me know what you think about my How to make French Press Coffee. 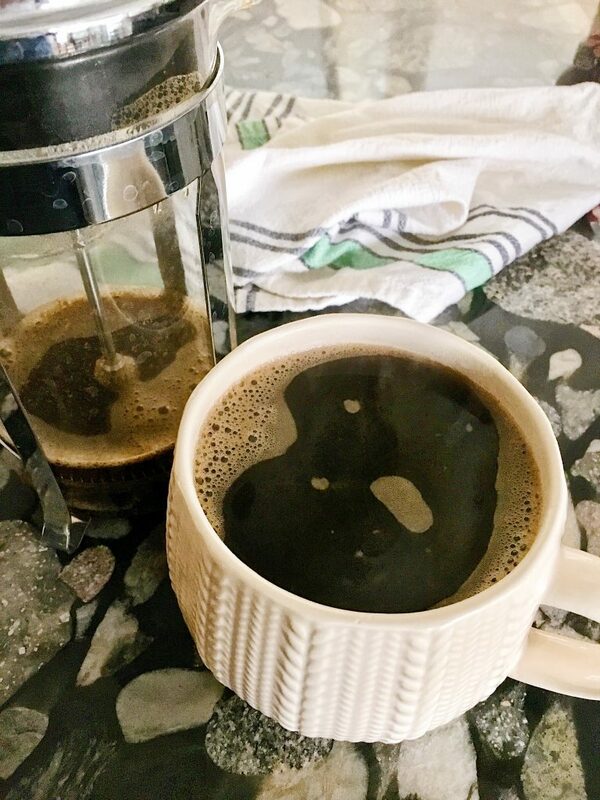 DO you prefer French Press coffee or some other way? My husband adores French presses coffee! Great tutorial! We use our French press every day, the only way to have coffee in my opinion 😋 yummy! Thank you! and there’s always tomorrow morning to look forward too! Oh how lovely! I want try this just to buy a beautiful French press like that! Kym, don’t forget how to foam hot milk! I totally did an Instagram story doing that! I used chocolate milk. Looks great! and wonderfully fresh!